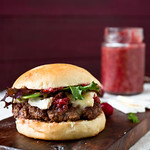 Even before the last of those lovely bacon jam-filled pretzel rolls disappeared, I’d already staked out the idea of combining the bacon jam with cranberries for a spread-on-anything and stuff-in-everthang twist on cranberry sauce. 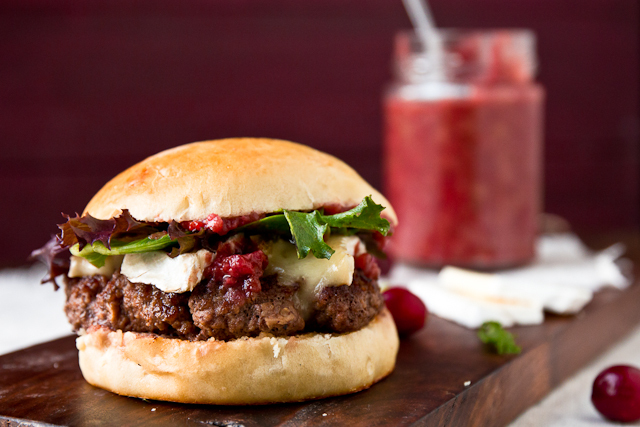 The original attempt of turning bacon jam into cranberry-bacon jam failed. Well, as much as something called “bacon jam” could fail. While tasty – and then, of course, still completely devoured – there was simply just too much bacon. A feat that I didn’t even know was possible before! So I turned cranberry chutney into bacon-cranberry chutney instead. Plenty of tart cranberries and just enough bacon to turn the sweet and savory and smokey chutney into a “just one more spoonful won’t hurt” spread. I put it over baked brie. And on burgers. And sliders. And then I made a second batch and did it all over again, making The Cranwich for lunch 3 days in a row. Festive and delicious with layers of flavor. And just enough bacon. 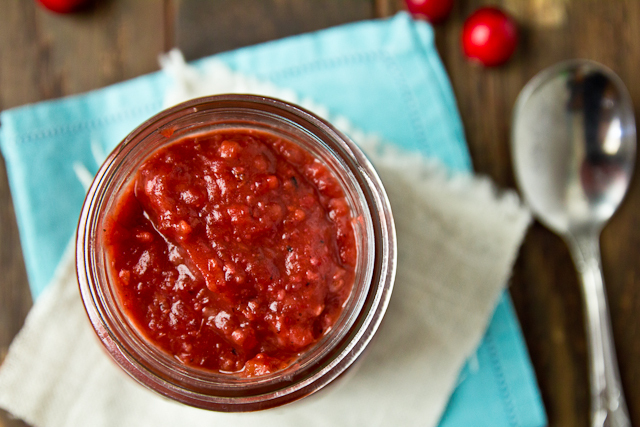 Homemade cranberry chutney flavored with smokey bacon. Cook the bacon in a medium sauce pan until mostly crisped and then remove with a slotted spoon to a small saucer. Add the onion to the pan and cook until softened, about 5 minutes. Add the garlic and stir, cooking another minute. Return the bacon to the ban along with the remaining ingredients. Bring to a slow boil over medium heat and then cover, cooking for ~10 minutes until the cranberries have softened. Remove the lid and let simmer until nearly all of the liquid has cooked away, about another 10-15 minutes. Taste for sweetness and add another tablespoon or two of sugar, if you think it needs it. Transfer to a food processor or blender and pulse a few times. Transfer to a jar or bowl and keep in the refrigerator where it will last a good 2 weeks. Probably. I’m feeling like this would go over so well as a holiday hostess gift!! Salty sweet smoky love. How bout jack the heat up with some jalepenos…yewhaw! I’m reading through this recipe and step 5 says to add bacon back and bring to a boil until cranberries are softened. I’m assuming during this step, I add all the liquids from the ingredients and the cranberries? Just want to make sure I’m making it right. ALL your recipes are so good, I don’t want to mess this up!